The Tire Choice offers dealer quality auto repair services and carries many brand name tires that are ready to install for your car, truck or SUV. We specialize in oil changes, tire rotation, wheel alignment, and more guaranteed at the lowest prices. The Tire Choice is Florida's fastest growing tire and auto service chain and a member of the Monro family of tire and automotive service stores. CouponSurfer Rewards members get 7% cash back in-store. Just Click to Activate Offer. 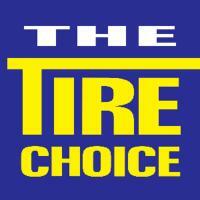 Find a Tire Choice Service Center near you.